With the Baltimore Games Day less than 3 weeks away, I figure it's time to start getting my stuff together. I've got a couple things I need to do before the big day. My Wife says I'm allowed to go (you married guys understand) and I've already bought my ticket (so she can't change her mind). I've got my army together, but I need to finalize my list. I usually run at 1500 points, but wait a minute, is there even a 40k Tournament that day? I can't find any info on it or what the point level is if there is one. I'm fairly sure there will be open tables and such for gaming, but are they running a Tournament as part of the North American Circuit? Looks like I'll need to figure it out. If anyone knows for sure and can point me in the right direction for more info, it would be greatly appreciated. Once I figure that out, I'll know if I can bring my army "as is" or if I need to make any changes to my list. Not that I'm going to make it a legal list, just what point level I should show up with. Of course it goes without saying that the Storm Wardens army will be on display and the winner will be picking it up that day (if everything goes according to plan). That's a must see. Fritz and Jawaballs are gonna have a table there and I'm planning on crashing that party for a little bit to meet them and see what they're up to. The Iron Fist League is running a Rapid Fire Tournament during the day with a series of small, 500 point games I think as well. If any FTW members (and readers for that matter) are going to the Baltimore Games Day, let me know, I'd love to meet up and maybe get a game or two in. Saying that, it's not as big over on your side of the water as it is here (in the amount of stores, at least - you guys certainly equal us in enthusiasm!! ), so they might not have the resources to paint enough minis for everyone to play with. Either way, I hope you have a fantastic time. Our GD is at the end of September and I'm really looking forward to it - Ticket: Bought. Wife's Permission: Granted. The IFL will be running a Rapid Fire tournament again, for both Fantasy and 40K. I too will be there. Sadly the army that I was planning on bringing to Games day was stolen and I haven't had enough time to paint anything so IF I do then it would be totally unpainted. @Darren Lysenko - That's how Games Day USA used to be years ago. GW provided all the tables as well as all of the miniatures. Once they started having multiple Games Day events they stopped providing anything at all and left it up to clubs and retailers. I played in the Rapid Fire tourny last year, it's a blast and will certainly be doing it again this year. Do they care about painted minis in the rapid fire tourny? @Frank - Not in the slightest. Sounds like I may be slugging around some models then. Even though I didn't design the format specifically for Games Day, it's so perfect for it, you'd think I had. No tournament, no problem then. I can use my army as is. Oni: we'll definitely have to get a game in, I'll have 1500 points with me. You had it easy. I had to convince my wife to let me go on our daughters first birthday. I'll be there running our club table and would love to get a game in at some point also! Dual TL Las dreads are OK in my book! Ron we can try to get a game in. If we have room, we will have two full gaming tables set up to play on. I don't think there will be any tables for open gaming, which is sad. You would think they would set up loads of them. My first gamesday they had lots set up, but none last year. I will try to get us as much space as possible. We will be running a couple of small gladiator tournaments throughout the day, but I mostly just want to meet people, and have fun! 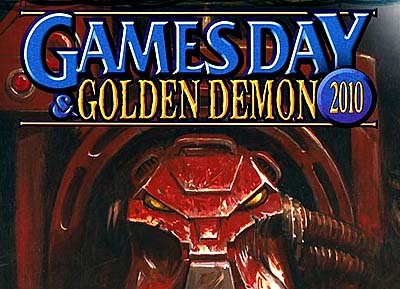 I think GW's Games Day page lists some group battles w/ 500pts each.